Rieker Swanky L3870 women's velcro shoe. It features a leather upper with contrast stitch and button detailing, the velcro fastening allows for adjustability and a secure fit when walking. 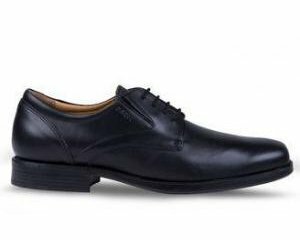 The slip on style allows for the shoe to be put on and taken off with ease. Rieker's Anti-Stress technology provides shock absorption and lasting comfort, making it ideal for everyday wear. It has a low 1.5 inch heel which offers a bit of height while still providing stability, the hardwearing rubber sole is still flexible. Rieker Swanky is a practical and comfortable choice for everyday, available from a size 36-41 (3-8).